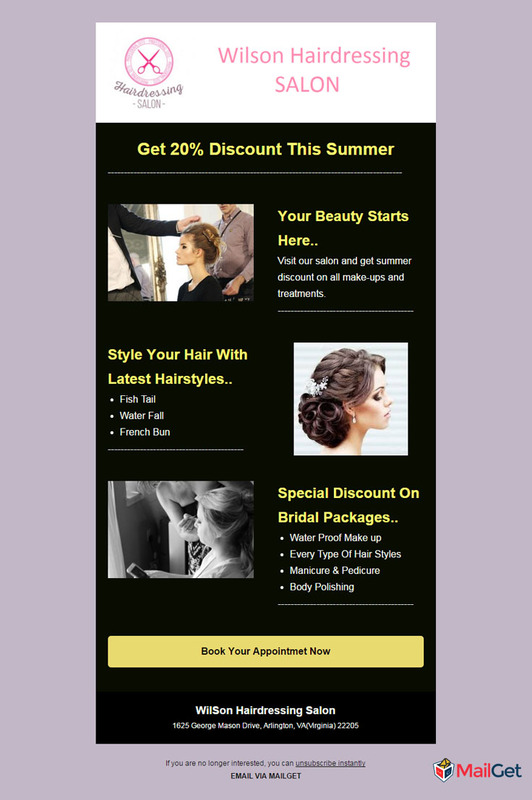 Thinking of how email marketing could generate more conversions for your hair salon business? Well, it is impossible for one to make his customers familiar with all the beauty offers and policies regarding their business in an efficient way. On the other hand, it’s has become the foremost task for proprietors to reach to the customers in a way that will benefit them. It has become more easy with the increasing use of email marketing for business promotion. Engagement with your potential customers. Spreading more awareness or circulating information about your services. Creating brand loyalty among customers by strengthening what makes your salon unique. Well, MailGet is the one stop solution for hair salon email marketing where one can easily create, send, track email newsletters, surveys, and autoresponders. MailGet’s marketing campaigns ensure high deliverability and much more. !! As in today’s era, everyone uses email and checks them frequently. So, promoting your hair salon business with email could be the most efficient and converting way to keep your potential customers up to date. Start sending newsletters with attractive offers, latest services, exclusive discounts, and much more. Make use of an amazing Email Template Builder to create beautiful emails. Are you free on Thursday? Thursdays relaxing and surprising like never before! enjoy a gift for the same. from our highly trained team and a surprise gift too! Tuesday be as ordinary as the previous ones. Birthdays will be happier now. therefore, offers special discounts on their birthdays! Get a picture perfect makeover this birthday and make it memorable for years to come. Grab the golden opportunity and visit us for best services. Look gorgeous this festive season. this season with our advanced services. Enjoy attractive offers with us this__________. help you get a new avatar for the festival. Grab your opportunity and enjoy our premium services this _______, that too on special prices! Don’t miss this golden chance and visit us as soon as possible or book your appointment today! team. We are here to offer you a special discount of 10% only for group visits. Special offer for you and your loved ones. Abc Salon celebrates friendship by offering a special discount up to 10% on visits in group. with our premium services, that too on special discount! best experience in minimal prices. Tell them you love them by bringing them at our service! immense delight to have you again. delight to have you again. offering you our best services with quality products and advanced methods. positive response from you. You are assured a great experience with abc Salon. any service on straight 10% discount. card for your next visit. Avail the opportunity and enjoy our quality services as soon as possible. our first rate services at discounted prices. A strong, eye-catching subject line is yet another important thing to look for. Now, this could include words that could attract users like “SALE”, “Summer Offer” & “Limited Time Left” etc. After sending the emails, you might be worried about whether your email has safely reached to the inbox, whether anyone clicked on it, etc. In short, you might want to know your user’s responses to the email. Well, Email Tracking feature is the right answer for all your queries. How many people have opened your template ? How many emails have successfully delivered to their inbox ? What number of people have clicked on the links ? And, how many people have unsubscribed you. It’s a great feature to track your sent emails and to know the performance of your business. Want more scaled information about your emails ? The type of browser user used. Know whether a user is using a smartphone, tablet or any other device. And also, track the location where he opened your email. 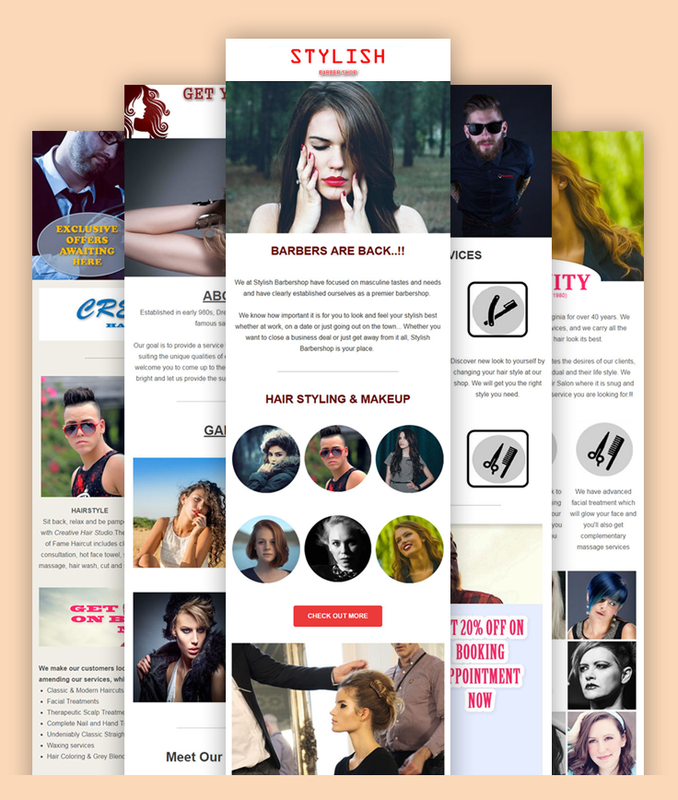 Do you also have a website for your hair salon shop ? If so, just make sure you are collecting emails every single time someone steps foot into your salon. Well, that’s exactly the web form comes into use. Add form on your website -> Collect leads for it -> Convert visitors into potential customers -> and start growing your business online rapidly. For an added bonus, use an email client like MailGet to manage your email lists and measure your campaign’s success. Ensure to get increased delivery of your emails by maintaining a healthy email list of customers properly. Stop Loosing Potential Sales. !! The most important thing to remember is that always make sure to give customers a reason to try your business and plenty of reasons to keep them for coming back. 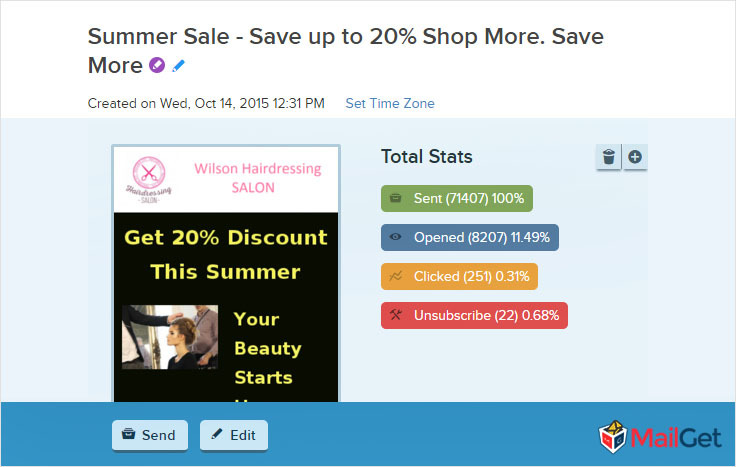 Email marketing for hair salons has never been easier! Looking for incentive ? Check out our Free Hair Salon Email Newsletters to get the juices flowing! Done with the suitable template for the salon. What is the roadmap for its marketing? Thus, an impeccable marketing solution for the same providing you the best accumulation of email marketing services for beauty centers and salons. In fact, we have also got some of the best themes for your beauty centers and hair salons!